This fantastic bell tent is ideal for guests to enjoy a great glamping getaway near Margaret River in Western Australia. The interior of the tent is furnished with either a comfy queen-size airbed or two single beds depending on guests' requirements. Three additional guests can be accommodated if required, making the maximum capacity of the rental five people. Linens and towels are kindly provided by the hosts. Outside, guests will have a lovely area with a table and chairs meaning they can sit back in the evenings to the peaceful sights and sounds around them. Other handy amenities include battery-powered lanterns and fairy lights, internal and external eco recycled floor mats. Bar fridge, a kettle with coffee, and side tables can be added as an additional extra. On the camping site, guests will have several handy amenities including large, private, and shaded powered sites, as well as an onsite general and liquor store and a neighboring café, making this a fabulous place to relax. Inside the tents, guests will have battery powered lanterns and fairy lights, decorative finishings, and all linens and towels provided. Outside, glampers will love the patio area with a table and chairs which is a great spot to relax in the evening after a day of adventures. 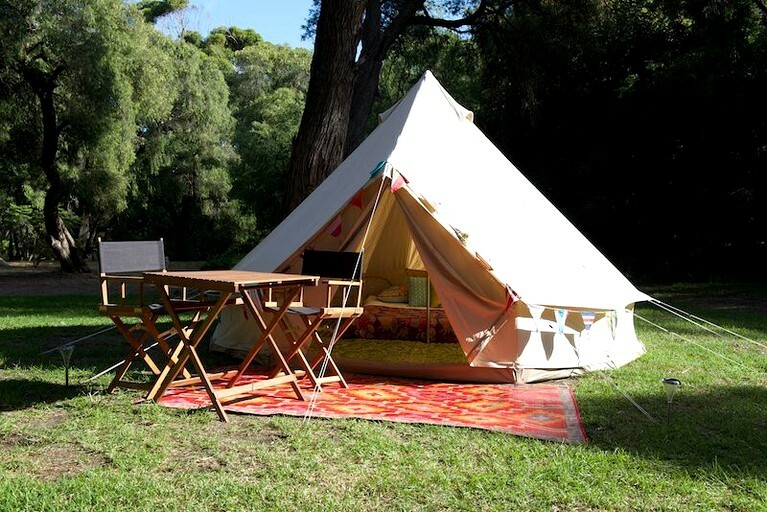 This luxurious bell tent is located just a short 10-minute drive from Margaret River town center in Western Australia. The child-friendly park offers guests a place to relax and enjoy this stunning area of the world. Nearby Gnarabup and the Margaret Rivermouth both have gorgeous sandy beaches and are located just a 10-minute drive from Margaret River township. There are many exciting outdoor activities to partake in whilst staying at this property. Guests can make the short trip to Gnarabup and the Margaret Rivermouth which offer fantastic sandy beaches just a 10-minute drive from Margaret River township. Surfers Point in Prevelly is one of the main reasons that this small outback town blossomed into a region filled with the spirit of adventure. Experienced surfers will adore the fabulous conditions here while those who want to watch some surfing will be able to see the way Australians take on some of the best Indian Ocean waves. Guests can also head a to Yallingup Beach just 30 minutes away which offers them the ideal secluded area to chill out to the sounds of the ocean. It is a purely natural coast with no buildings taking over the scenery, so guests will truly feel immersed in nature. Guests should also make sure to visit the Canal Rocks while in Yallingup as they will witness a truly spectacular sight. Glampers can stand and watch the sea crash against the Australian coastline to understand how this jagged rock formation was formed. A refundable security deposit is required.